Have you ever wondered exactly why raw-milk cheese is so important? Have you ever asked yourself why so many of the world’s most famous cheeses (Comte, Swiss Gruyere, Parmigiano-Reggiano, to name a few) are legally required to be made from raw milk? Raw-Milk Cheese Appreciation Day is your chance to ﬁnd out what makes these cheeses truly extraordinary. The Cheese of Choice Coalition, Oldways, and the Guilde Internationale des Fromagers are teaming up on Saturday, April 18th for a worldwide celebration of raw-milk cheese. A wide variety of creative events are in the works across the US and around the world, from creamery tours and tastings in Oregon to special classes in Vermont. 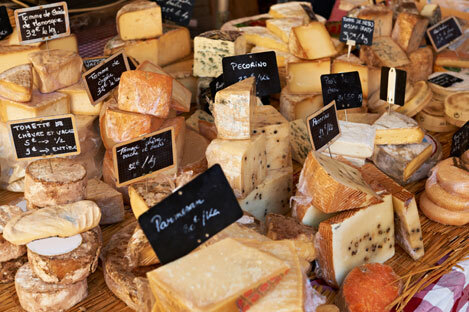 There will be producers sampling out cheese at retail stores in San Francisco and cheesemongers sharing their love of fromage au lait cru in Paris and Boston. Wherever there are lovers of traditional cheese—from Melbourne to Montreal, and London to New York City—there will be a Raw-Milk Cheese Appreciation Day event to celebrate it. Join in on the fun on April 18th and help salute raw-milk cheese and the individuals who bring it to life from the pasture to the plate. You certainly won’t leave hungry! For more information on participating in Raw-Milk Cheese Appreciation Day please contact Carlos Yescas, Oldways Cheese Coalition program director, 617-896-4822, carlos@oldwayspt.org.